This premium ID Dog Collar is the perfect replacement for your pets ID tags. No more "tag jingle", not more lost tags, and no more worrying what will happen if your dog gets loose. Made in the USA with patented metal buckles, this is a top of the line dog collar that is backed by the Yellow Dog Design 100% Guarantee. If it frays, fades, rips, breaks, is chewed or damaged due to any reason other than a tie-out, we'll replace it! Fully Guaranteed if defective, chewed, broken, or even lost! Ive ordered the same color quite a few times due to breaking or a smell i canf get to wash out. When i received this one i was very disappointed compared to my old nasty one i could immediately see the quality difference. This one definitely womt hold up very long. Awesome product. The personalization is clear and easy to read. The buckle is sturdy enough to stand up to my hyperactive pups! I ordered one for our first doodle because he kept loosing his tags. Loved it so I ordered another for our second doodle and schnauzer. I bought the collar for my daughter’s labradoddle. It has his name and her cell phone number on the collar.. Looks great in light blue collar with navy lettering. He’s a rescue dog and sonetimes runs away from the house.. This way we know if he gets lost that the family info is obvious.. I feel good knowing that he is wearing his collar at all times.. My dsughter & her family love it too. Their othet dog had one I bought earlier.. I ordered a collar for my daughter’s labrododdle. He is a rescue dog and is prone to run off if accidently he gets out of the house. The collar which I think every dog should have, has his name and my daughter’s cell number.. I love knowing that if he’s on the run, the family contact info is right there.. plus it looks great. I got light blue with navy lettering. great gift for the pets you love!! This is my 3rd or 4th Hot Dog Collar (2nd one for current dog), but it's my first with the metal clasp. In addition to being nice looking and smooth operating, I should no longer have to worry about the clasp breaking like one of the previous plastic ones (100+ lb Labrador). Hot Dog Collars ALWAYS does such a nice job on my dog’s collars. I’ve used them many times. Thank you for your beautiful work!!! We liked the plastic clasp and parts style better. The metal closes with less effort and there is no "pop" when it closes. We bought two collars for our dogs and lost one in no time either to us not closing it proper or thru play where one dog bit down just right and it fell off. We reordered the plastic version and like them better having had plastic clasps before. 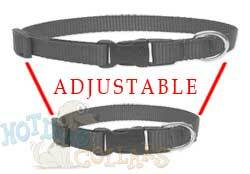 The collars also lay flatter on the neck due to a slightly larger adjuster where the metal is smaller.